For whatever reason, I find it particularly difficult to design a boy's bedroom. Do any of you feel the same way? That being said, if I ever happen upon a clipping of a boy's bedroom that I like (rare), I quickly throw it into my files for inspiration. Sometimes one just needs a place to start! Serena and Lily is an excellent source for inspiration when it comes to boy bedrooms. Strangely, I usually don't love their girly rooms, but they rarely miss a beat when it comes to the little guys. Both of these are perfect for the 10+ age group. A stupendous design for your "explorer". Highlights: the shade, the mobile, and the well-placed colorful accents. Perfect for the Pez-lovin' boy...whether young or tween. 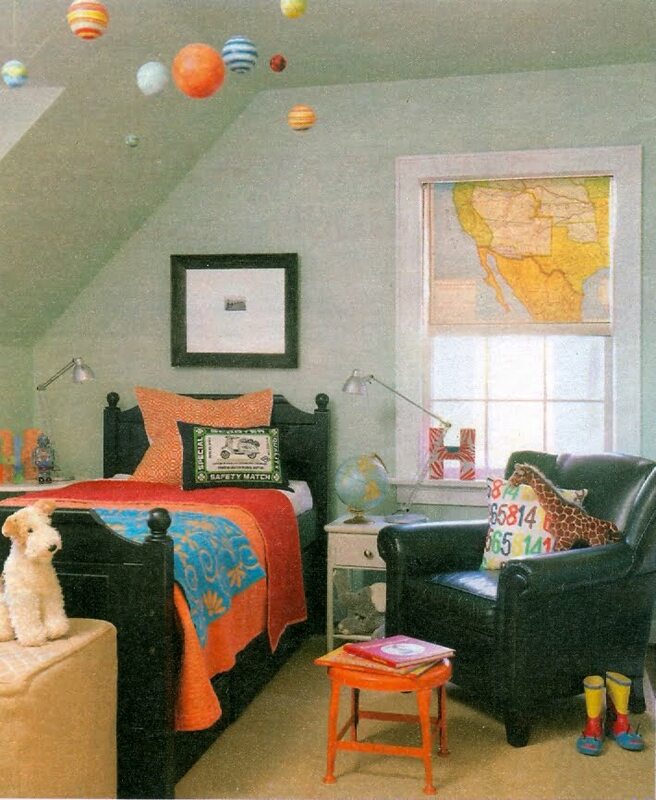 I like the versatility of this room as it could easily transition from 4-year-old to 12-year-old with a few touches. Surprised at how much I like the combination of chocolate brown and red. I have 2 boys, 3 1/2 and 4 months and YES find it very difficult to find great stuff for boys; clothing and interior decorating wise. These are great and I do also love the Serena & Lily boys rooms. Fabulous! I do think that boys require a little more thought and digging for the "right" things. One of the neater things we did for my son's room was to use a tool chest from Sears for his nightstand! It's bright red and offers great storage plus he will be able to use it when he is an adult! In terms of decorating, I feel as though you want to strike a balance. The idea, at least for me, is to combine things that you like, colors, items, patterns, with a structure that is aesthetically pleasing. My question then is, is it important that boy's rooms and girl's rooms are decorated differently? It would seem to me that a better solution would be to expand on the interests likes/dislikes your child has and go from there. I LOVE those Serena and Lily pendant lights. I wish I could find a floor lamp like that (for Finn's room which doesn't have overhead lighting. Argh!). And the pez. We have Brad's whole collection in a box in our garage and I'm still trying to figure out how to use them. I am currently transitioning my boys room from crib to big boy. These are great. Thanks for the ideas. We are building a new home, and so designing the kids' rooms from scratch. I love the explorer's room. It really fits our bill. Know any sources for the map window shade? I think your comment about those rooms being for boys 10+ is a good one. My six year old insists on superhero bedding (thank goodness PB has some tasteful versions). I simply don't think there is a way to do a Serena & Lilly-ish superhero room, but I may be wrong. However, when my boy is 10 and has outgrown that superhero phase...I think redecorating his room will be a great bonding project for us. He is already helping me refinish a pair of Craig's List chairs, so I see him really digging in and creating an awesome room. makes me wish for a little boy! 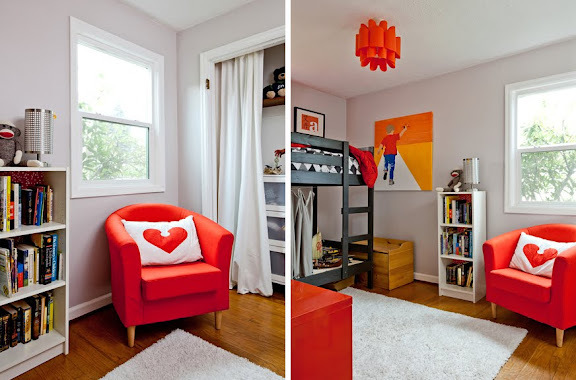 I totally agree it can be so hard to find inspiring stylish and unpretentious boy rooms. Great pics. I am in the middle of a restyle of my 4 year son s bedroom and just found all the inspiration I need to finish.